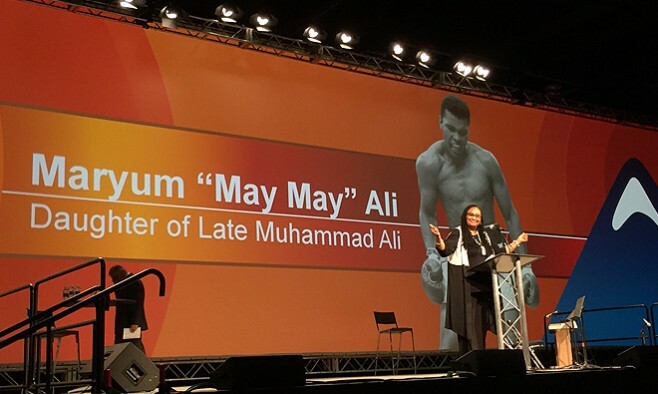 As part of her inspirational speech at the opening ceremony of the fourth World Parkinson Congress (WPC) in Portland, US, Maryum ‘May May’ Ali wowed the audience with an poignant poem she wrote about her father Muhammad Ali, who lived with Parkinson’s disease for more than three decades and died on 3 June 2016. The eldest daughter of the boxing legend read out her poem to thousands of neurologists, healthcare professionals, patients and their carers. Also addressing the packed crowd was former NBA basketball star Brian Grant. May May’s poem to her late father touched upon his heroic actions in and out of the ring, referencing iconic quotes and calling him “a pearl embedded in the oyster of life”. Read the poem in full below, as transcribed by Twitchy Woman. What a hero he is to me but more so heroic in the face of adversity. Lightning speed within a square ring turned into slow imbalances while praying for nights like yesteryear spotlights on The Ali Shuffle. The rope-a-dope fight is now a rope-a-dopamine battle. Parkinson’s – akin to traversing upstream in a canoe with a leaking hole without a paddle. Yes, it is a struggle, but what I admire about my father is his determination to not let symptoms defeat his soul and refusing Parkinson’s to retreat him into darkness taking its toll. Throughout diseased phases he maintained divine praises to his Creator, and I witnessed in the early stages his ability to still raise his once powerful fist despite recurrent shaking. Yes, Dad, you are a pearl embedded in the oyster of life, protected by your faith and elevated through social strife. Standing up for the right to be the man you manifested. Now you stand with a walker. No vanity. Now a softer talker if you talk at all. But what remains the same is your spiritual stance, a presence remaining tall. I am so inspired by your choice to live your life to the fullest it can be with over 30 years of PD riding heavily on your back. From your earliest days to your latest, you haven’t wavered your love of self.